lantern reflectors, 16 oz. Bud Light, and 12 oz. Sun Drop. Did you cut the height down on either one besides the rims? The height may be trimmed maybe 1/4" to get the edges smooth (I sawed the tops and bottoms off with a thin serrated steak knife). The Bud Light fits just right inside the 220 frame, and the Sun Drop just kind of holds on itself. I think a simple piece of string can be used to hold them on if the sizes need to be smaller. Just looking to make a bow lantern for a sail boat that only has a small solar battery system. If some rear light is needed, a paper hole punch from the Dollar Tree can be used to punch rows of holes along the rear bottom. Nice work on the reflectors! I like how they are built in and compact. Guess what mine smells like ,when I fire it up?..campinut.. Like a moth at night, I am attracted to the light!..7/7/1964...Russ, from Missouri.. I'm slowly working on a folding aluminum reflector for the 285A that snaps under the tank similar to the below 220 folding aluminum reflector (needs to be polished again after many years sitting on moist concrete). Note the spare plastic mantle pack sticking out under the left side of the reflector. Due to the 285A having no frame, a string/bead chain or similar will be needed to hold the front edges of the reflector together around the front side of the globe. Let's just say I like reflectors as well and leave it at that...…..
A old metal fan blade will work also, cut to shape and rivita bracket. Some good ideas here...I have a plan already! It's Spring time; get outside! Just a follow up with a simple cotton string to hold the Sun Drop reflector in place on the 285A and the reflector rolled up and kept on the bail. I've often used a piece of aluminum foil wrapped over half the globe as a field-expedient reflector. Is there any type of coating on the inside of the aluminum cans? I tried some Mother's polish to shine up the surface and it was kind of a slow go. The inside of soda cans do have a coating but can not remember what it is, supposed to protect against the tin taste but does not work for me. Give me glass please. Tin cans have some sort of plasticky coating--used to be BPA but that's banned now. Nice tidy reflectors Zoomkat. Perfect for night fishing! Not sure when this one got made by its owner but it has "the look"! My wife called it "the Flying Nun". My best gal is a Coleman outing pal! Cotton will char if it gets really hot, but I don't really expect that high of a temperature. I can verify the next time I fire the lantern up. Poly based string might well melt, so check what the string is made of. 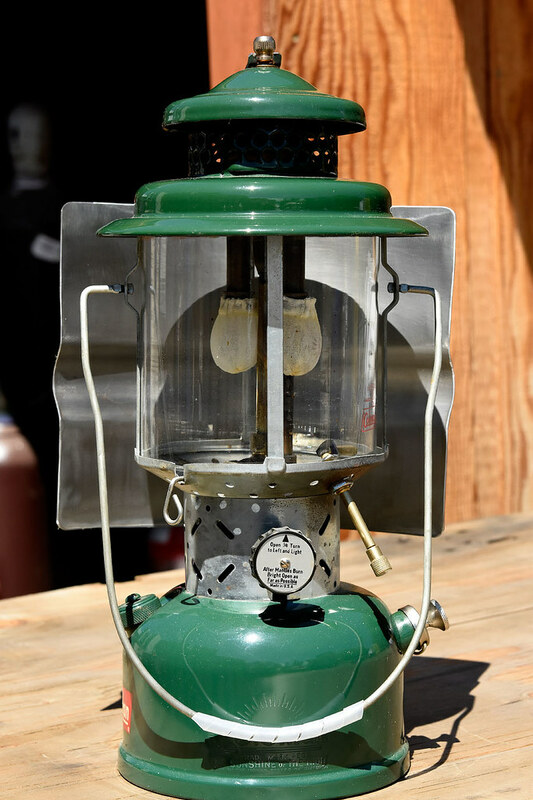 The really small single mantle butane and propane lantern globes might get hot enough to light a cigarette. I've measured globe temps on a 242 at around 800F using a contact thermocouple. Cotton should start to smoke somewhere around 450-500F. Worse case scenario in your case? String burns through, falls to the dry leaf litter on the ground and burns down a state or two. Or the reflector just falls off. Probably leaving a stain on the globe. The Super Pyro reflector wins so far, in my book! Modern aluminum and steel cans--they never were made of tin, just coated with it for a short time--is an epoxy, which shouldn't release BPA into your drink. I'll stick with glass, given the choice. The best way to remove the coating from the can that I've found is to burn it off, then polish. >>Just a follow up with a simple cotton string to hold the Sun Drop reflector in place on the 285A and the reflector rolled up and kept on the bail. Can you just put the reflector inside the globe? - The internet is loaded with scams. Send me $19.95 and I'll show you how to avoid them. "Can you just put the reflector inside the globe?" You probably could, but my luck would be to wipe out the mantles fiddling in side. I've had the 285A lantern running now for 2 hours and the string seems to be holding up ok, getting a slight brown tint. I've got some ball chain as an alternative to the string. I checked some temperatures and the hot spot on the vent is 600 deg. and the hot spot on the back of the reflector is 300 deg. I'm going to let it run the tank out. I've got a heavy aluminum foil serving tray and will cut out a similar piece to see how well it will work, maybe with some polish. I checked the light with the lights off and it does throw more light out front as desired. Iv'e seen some of the commercial reflectors out there and have come to the conclusion i want to make my own.,So I have now started down this road. Get a piece of thin wire to use in place of the string. Some follow up pix from running ~3 hours at full output (adjusted to minimize any over burn). The string seemed to do ok with the most darkening at the spot where the string went thru the hole in the aluminum. There is some darkening of the coating on the aluminum. I added a length of ball chain as a possible replacement for the string, but thin flexible craft wire might be a good cheap/disposable alternative. Note the Coleman mantle developing holes. BPA is a chemical component of the epoxy coating. Any plastic that is flexible and in any way soft contains BisPhenol A. It's called a plasitisizer, as it makes otherwise rigid things plastic. The question is, does it release the BPA into whatever you're packaging in it? Once again, I prefer my beer in glass. Quick update on the Sun Drop reflector. I took a DollarTree sanding sponge to the inside surface of the reflector to see if it could be polished some. First the coarse side of the sponge, then the finer side. This seemed to remove the plastic coating, especially the charred area. Then I used some 2000 grit auto body wet sanding paper I had handy. Wet sanded with soapy water until it looked done with sanding, the used some Mother's Mag polish I had to see how it would shine. Seemed to work well to put on a more mirror like finish. I've got a couple more tweaks, then will try it on the lantern again. KRAAAK. Had 2 globes bust on a 290 To much heat over time. Here is the reflector that my grandpa made for his fishing lantern. He spent 32 years as a foreman in the aluminum fab shop at Godfrey marine. 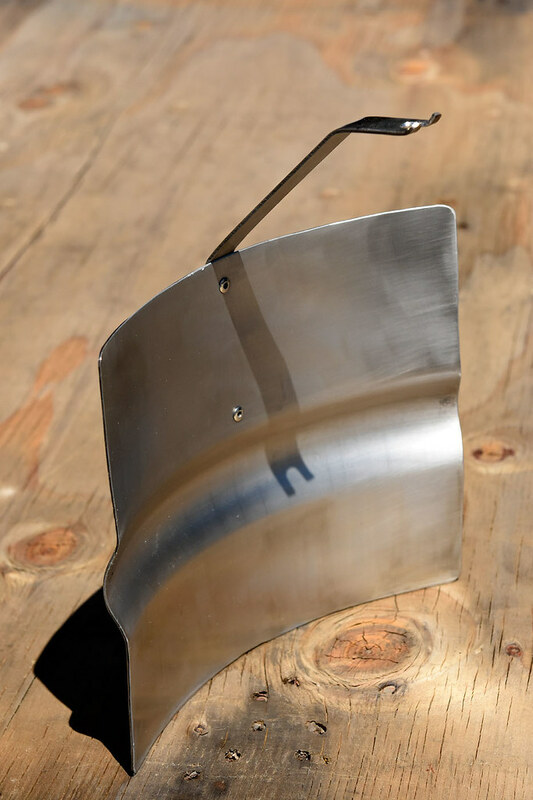 This reflector was made out of the same aluminum that is used to make pontoon tubes. Vintage and cool! I love that the can says "Super Pyro" on the back. Zoomkat, when I saw your first post I thought this guy must be from NC. I’ve travelled all over this great Country of ours and only found Sundrop sold in a couple of other places. I’m pretty sure bourbon sales would drop significantly here in the eastern part of the state if Sundrop were no longer available. Nice reflectors by all who have posted. Build a man a fire, and he'll be warm for the night. Set a man on fire, and he'll be warm for the rest of his life! 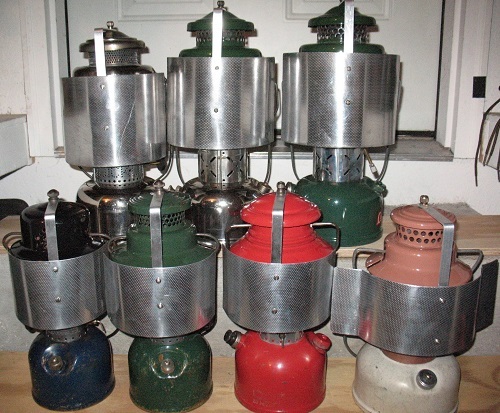 Looking for my B'day lantern, any model, 5-74. That’s on my long list of to do’s. Some small tweaks. I made some small inward creases using the edge of the kitchen counter to act as high points that will contact the globe. This should make for small air channels between the reflector and the globe. Added some holes using the DollarTree paper punch along the bottom. This should provide for some cooling air circulation and maybe a little light out the back. I've got it running outside now to see how things go. Looks like it would be good for walking at night where the walkway in front needs more light or directed light is needed. close to the globe,seemed to work fine, I will have to see if I can find it. I made one out of a fuel can to save a spare bracket for a 275 that I had. I don't own a turd so it went to another member that did. "Here's one I found homemade reflector & handle"
If that one had a large eyelet screwed in the top of the handle, it could be hung from a wall nail. suggestion on the 285 reflector. maybe consider cutting the can up to 1/2" taller than the globe and the making tabs on each end of the top and bottom plus one or two evenly spaced in between. you would remove the 1/4" excess across the top and bottom leaving the tabs to be bent over the globe. Robert (AKA Curly)-- Heart-of-Texas! "Keep 'Em Working"
Some follow up pix. The reflector in second test operation, string holding the reflector after the second test with polish and tweaks, 24 ga. "bead wire" replacing the string, and rear view of the reflector. I didn't notice any further discoloration after the cooling mods. 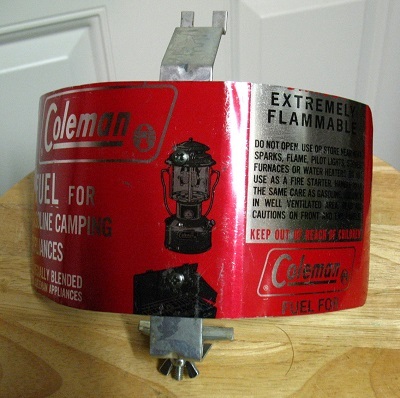 If you have a an aluminum can, pointed scissors or knife, and some cotton/natural string, you can make a simple type of reflector for the 220 and frameless 285/295 (and propane) type lanterns. I found it interesting that the inside of the can can be polished fairly quickly. "maybe consider cutting the can up to 1/2" taller than the globe and the making tabs on each end of the top and bottom plus one or two evenly spaced in between. you would remove the 1/4" excess across the top and bottom leaving the tabs to be bent over the globe." Hanging tabs is an interesting idea. I think I have another can handy.